Brick Barbecues are easy to patch up with our extensive range of spare parts. Here you can just replace the part you need without having to replace your whole Barbecue kit or you can upgrade your existing barbecue kit with stainless steel cooking grills, deep ash trays etc. Stainless Steel warming rack 90 x 20cm. Suitable for any of our large brick barbecue kits. 6mm stainless steel rods. This is a BLACK deep charcoal grid measuring 1020 x 342 mm and is compatible with any of our extra large brick BBQ kits. 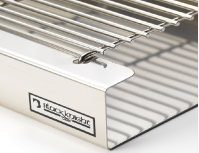 Heavy duty stainless steel warming rack 112 x 20cms. Suitable for use with our Extra Large Barbecue Kit range. Minimum quantity for "67cm Black Shallow Ash Tray (3 bricks)" is 1. Minimum quantity for "67cm Black Deep Ash Tray (3 bricks)" is 1.